Tilly and the Buttons: Club Tropicana Embroidery - Join Me! 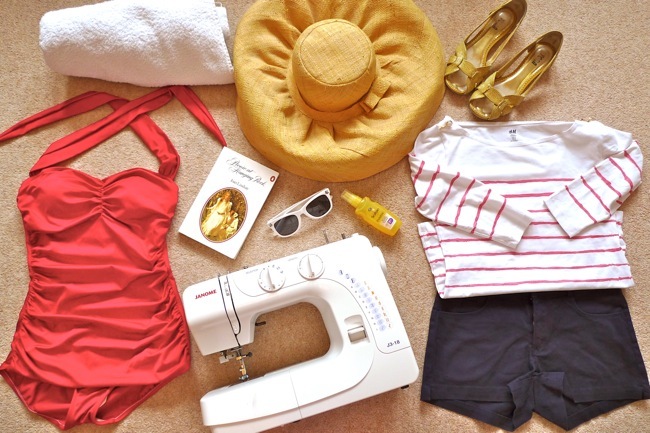 Sewing machine won't fit in your beach bag? Worried you'll get sand in your bobbins? Never fear - take your embroidery to the beach instead! I'll be running an embroidery table at the upcoming Club Tropicana-themed edition of The Make Escape on 28th August. Yes that's right, Club Tropicana-themed embroidery. It would be so awesome if you came along and said hello! The Make Escape is a friendly night of making things, making a mess, having a go and having a drink. Seriously y'all, it's a really great night, run by the lovely Momtaz, who you won't be able to miss - she's the gorgeous lady with the pink hair and huge smile. They'll be lots of crafty stuff going on, or you could just have a drink and a chat! It's free! With special thanks to the Village Haberdashery for donating the embroidery materials we'll be using on the night.